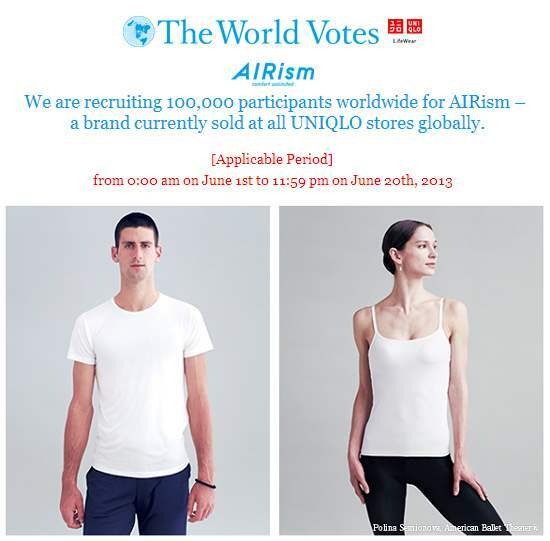 UNIQLO is recruiting 100,000 participants worldwide for AIRism – a brand currently sold at all UNIQLO stores globally. Introducing AIRism, UNIQLO’s revolutionary innerwear. With a soft, smooth texture completely unlike that of cotton, it delivers comfort to people everywhere, in any season, making it the ultimate daily wear. Next-generation functionality in a soft, sleek garment – that’s AIRism. Does AIRism, Uniqlo’s revolutionary new innerwear, deliver “comfort unlimited”? UNIQLO is putting this question to a world vote. 100,000 users from around the world will be selected to receive a complimentary AIRism garment, try it, and give us their answers. Votes will be tallied in real time at UNIQLO's website. UNIQLO wants to know how you really feel about the comfort of AIRism, so sign up online for a chance to let your voice be heard. Because your opinion matters. Upon being selected, sampling products may be picked up at stores within the countries where the applications are placed. Applicants will be unable to receive their products at stores in any other regions. Applicants selected will receive digital exchange coupons designed exclusively for smartphone use. Persons not owning a smartphone will be unable to use the exchange coupons. APPLY to be one of the 100,000 participants now! Selected applicants will be notified by email no later than 21 June. SEE ALSO: UNIQLO: Special Limited "Thank You" Sales from RM9.90!